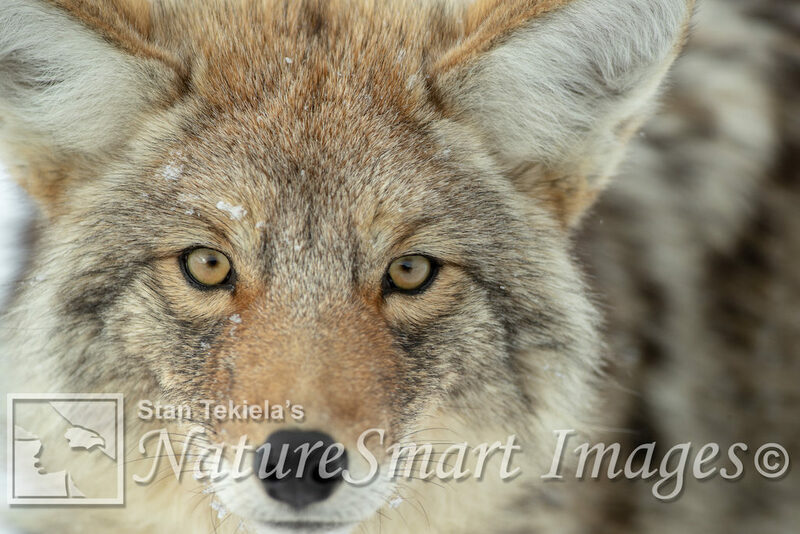 Naturalist and wildlife photographer Stan Tekiela set out into Yellowstone National Park to capture pictures of coyotes. Here is his report! I had been searching the snowy mountain landscape the entire morning and had come up empty-handed—no coyotes in sight. It was a cold morning with temperatures in the single digits, but the bright sun and lack of wind made it very comfortable. Just the week before, a storm draped a 30-inch-thick blanket of snow on the ground. This is exactly the weather and snow conditions I was hoping for during my winter trip to Yellowstone National Park. The colder the temperatures and the deeper the snow, the easier it is for me to see, observe, and photograph wildlife. While waiting at a prominent overlook in a particularly wide valley, I finally saw a coyote trotting in my direction. I knew this was going to be a good photographic opportunity, and all I needed to do was wait. I grabbed my camera and long lens; for whatever reason, this time I didn’t grab my tripod. The camera and lens combined weigh a solid 6 or 7 pounds, so you don’t want to hold them for long. Also, holding the lens up horizontal and steady enough for a clear picture can be challenging. When the coyote was about 80 to 100 feet away, I took a few pictures but noticed the background didn’t look very pleasing, so I quickly went down on one knee to lower my prospective and change the look of the background. A good wildlife photographer has to consider everything in the frame of the picture, not just the subject. The background is extremely important. Getting on the same level or, in this case, on eye-level really takes an image from basic to great. I started capturing what I believed were some stunning images of this magnificent animal. The coyote had a full and thick winter coat. I am always amazed that we humans need to put on so many extra layers of clothing, yet this coyote was warm and comfortable. It is always difficult to judge distance when looking through a long lens. 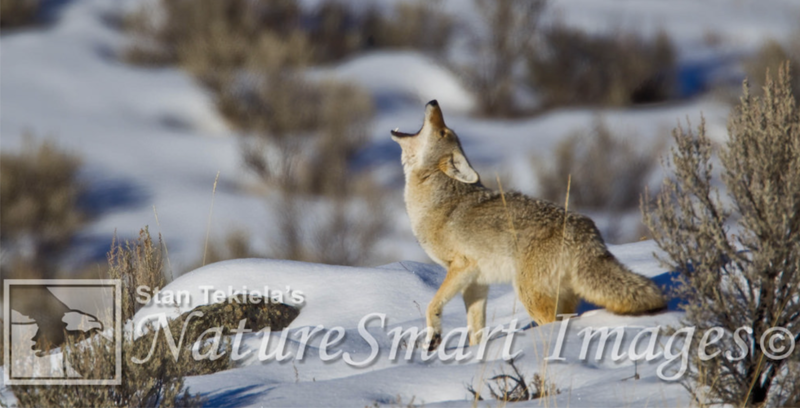 I could see that the coyote was getting closer and I was capturing some very good images. It was at this point that I noticed that the coyote was coming straight at me with purpose. I looked up over my camera to see the coyote with its head down and a very determined look on his face, heading right for me. Of course, my instinct was to get up off my knee and fully stand up. Remember, I was holding my camera and lens in my hands because I didn’t have time to grab my tripod. As the coyote approached me, I instinctively held my camera and lens between the coyote and me to block him. It was at this point that I realized the coyote wanted my equipment. I backed up one step, and the coyote advanced again; I took another step back, and the coyote continued to advance. I lifted the front of the lens, so it wasn’t at the coyote’s level. Again, I took another step back, and this awkward dance went on for several more steps. I must admit I was a bit amused at the boldness and curiosity of this critter. There is no way it could lift my camera and lens. They were just too heavy. After another couple of steps backwards, I became tired of the game. I quickly stomped my boot on the frozen ground, raised my arms, and yelled very loudly at the coyote. That is all it took. 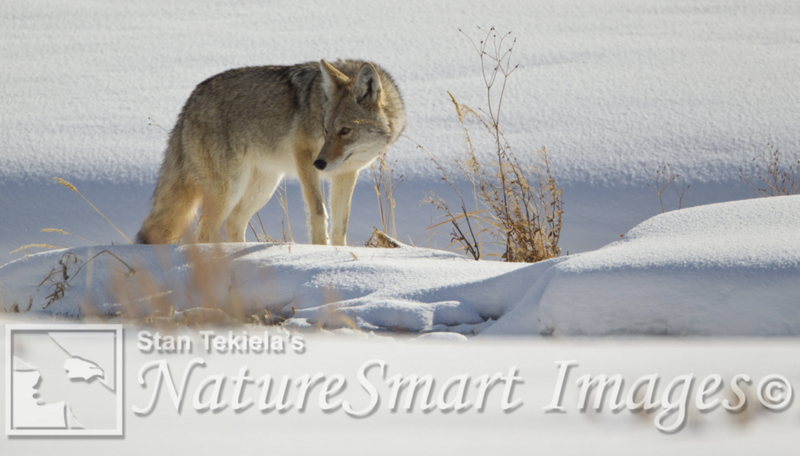 The coyote turned and took off running, with his tail tucked between his legs. He looked over his shoulder a couple of times; each time, I raised my arms and shouted again, which caused the coyote to speed up. It seems he couldn’t leave fast enough. You can follow Stan on Facebook and Twitter, or contact him via his web page. Stan’s nationally syndicated NatureSmart Column appears in more than 25 cities spanning 5 states (Minnesota, Wisconsin, Michigan, Illinois, and Pennsylvania) and is circulated to more than 750,000 readers. 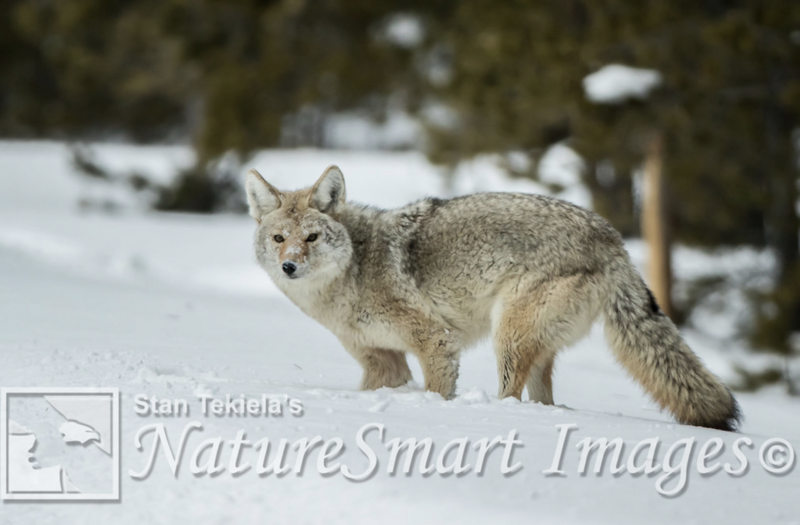 If you enjoyed Stan’s search for coyotes, sign up for our newsletter now for more great posts and information on our latest wildlife books.